Khomas residents last week rejected a proposal that when genocide reparations are eventually made, the money should be used to buy resettlement farms from Namibians of German descent. The issue was raised by participants at the Khomas regional consultation on land matters, at which regional stakeholders were given an opportunity to make recommendations on what should be discussed at the second national land conference in October this year. The recommendations include expropriation of land without compensation from absentee landlords, the establishment of an ancestral land tribunal, and amending the Constitution to add the "right to adequate housing" as a human right, as well as the implementation of the rent control and property valuation laws, among others. During the consultations last Thursday and Friday, Khomas chief regional officer Clement Mafwila made a submission that government should be allowed to use reparations money from the German government to buy resettlement farms. However, this notion was loudly rejected by the majority of participants, with some suggesting that using the money to buy farms would not denote justice for genocide victims because Namibians of German descent owned most of the farms. One of the participants, James Uerika, suggested that the government should instead negotiate with their German counterparts to compel the German farmers living in Namibia to relinquish their farms "in solidarity with the communities that they massacred". He said although the land issue needed to be dealt with urgently, there were other measures the government could take to solve the land problem. "The moment we take German money to buy the farms that are already owned by Germans, we are still not doing any justice to the process," Uerika stated. "The government should rather negotiate with the German government for the Germans to relinquish the farms they own as a solidarity gesture, not for us to take the money and buy the farms from the Germans again," he said, adding that the reparations money should be "for the socio-economic development of those communities". The Namibian reported in 2017 that Namibia was seeking about US$30 billion or close to N$500 billion from Germany in reparations for the 1904-08 genocide against the Nama and Ovaherero people. Over 65 000 people are believed to have been killed when colonial Germany crushed a Herero and Nama uprising between 1904 and 1908. The Ovaherero Traditional Authority's spokesperson, Uazuva Kaumbi, yesterday said the government must prioritise the primary beneficiaries of the genocide reparations, which are the Namas and Hereros. 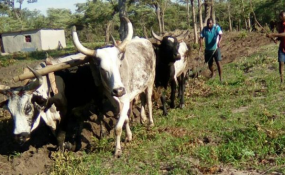 He added that the traditional authority under paramount chief Vekuii Rukoro was not against the use of reparations money to purchase resettlement farms, as long as it was to benefit the "direct victims". "There would be collateral beneficiaries in the areas which were inhabited by those people, so they will benefit from the clinics, the roads and other facilities that will be built there. "The money can also be used to resettle the prime beneficiaries first. And after the government has done that, they can start to look at other possible ways to help other Namibians," he added. Khomas governor Laura McLeod-Katjirua yesterday, however, said the regional position on the matter would only be revealed after a report of last week's consultations was compiled. "Ours was to make recommendations of what we want as a region to happen after the national conference. The land conference would take a final decision," she added. The second national land conference, set to take place from 1 to 5 October this year, will review the resolutions taken at the first national land conference in 1991, and find solutions for the burning land questions.